If your Excel workbook has a connection to a table or query in a SQL Server database, you can make sure it shows the most up to date information. Use the Refresh command (on the Data tab) to do this. Need to connect to your SQL Server database first? On your worksheet, click any cell that contains your SQL Server data. On the Data tab, in the Connections group, click the arrow next to Refresh All, and then click Refresh. Click any cell that contains your SQL Server data. In the Connections group, click the arrow next to Refresh All, and click Connection Properties. For very large data sets, consider running a background refresh. 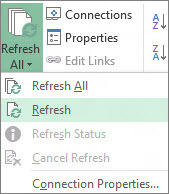 This returns control of Excel to you instead of making you wait several minutes or more for the refresh to finish. On the Usage tab, set any options you want to change, such as enabling a background refresh. Check the status of a query A message appears on the Excel status bar to indicate that the query is running. Double-click the message to check the status of the query. Stop a background refresh To stop a query that's running in the background, double-click the query status message on the status bar to display the External Data Refresh Status dialog box, and then click Stop Refresh. Stop a query To stop a query from running when background refresh is turned off, press the Esc key.